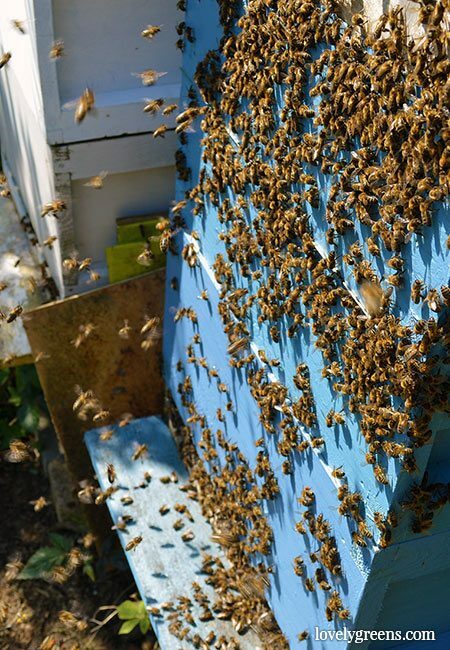 With each day moving us closer to summer, the weather improves and honeybees become more active. For a beekeeper that means two things — the honey flow will soon be on as will as the chance of swarming. 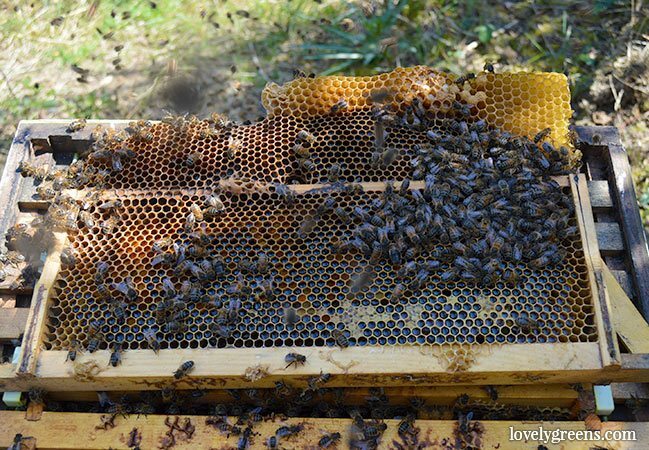 Between now and June we’ll need to visit our bees every 8-10 days to make sure they have enough space for storing honey and to see if they’re building Queen cells. 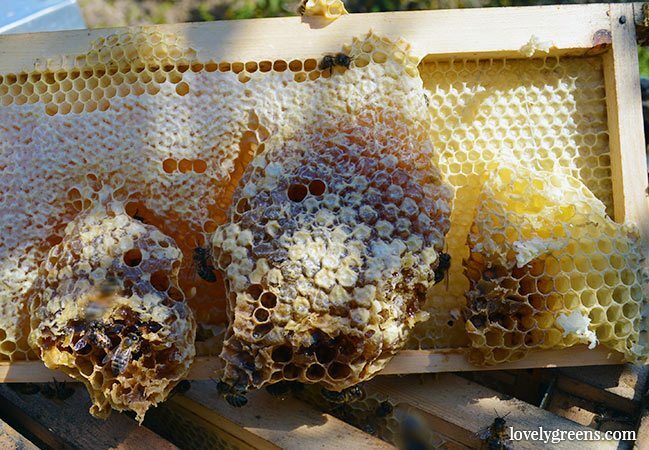 Queen cells are special peanut shaped fingers of beeswax that new Queen bees are raised in. If a new queen is born then the old one will leave, taking most of the mature worker bees with her. The Bluebell Bees after their inspection. After a few minutes they calm down and return to their normal schedule. So far, so good with Primrose and Bluebell. Those are the new names I’ve given to my white and blue hives. Usually at this time of the year I find Queen cells aplenty so it’s surprising to find none. I think that my decision to swap out their old brood frames by adding a full box of empty ones has helped keep them busy enough to not want to swarm. Swarming is a natural cycle for the colony and all honeybees will do it when their Queen gets old. They force the old Queen to birth a new one then the old dame flies off with most of the adult bees to build another home someplace else. If bees swarm before their Queen is old, it’s the beekeeper’s fault for not providing enough space or putting the colony in a less than ideal location. Bluebell’s Queen was above the excluder I put on last month. You can see that by all of the matte yellow cells in this frame — they’re capped baby bees. The crinkly white capped cells are honey. In my last update I mentioned that I was trying out a version of the Bailey Comb Change. It’s a gentle way to change out all the frames in the brood box without disturbing the bees as much. Since I didn’t have the Queen Excluder on either of the colonies over the winter I didn’t know where each of their Queens bees were when I started. It was 50/50 whether she was above or below the excluder I set on each hive’s old brood box. Those changes played out exactly when I checked their progress. 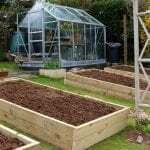 Primrose’s Queen was below the excluder and new brood box and Bluebell’s Queen was above and laying eggs in the frames meant for honeycomb. I’ll be honest in saying I’m not great at spotting the Queen so I’ve made an educated guess on where she is in both now. As a result, Bluebell is on Brood-and-a-Half and Primrose is on double-Brood. Time will tell if I’m right. 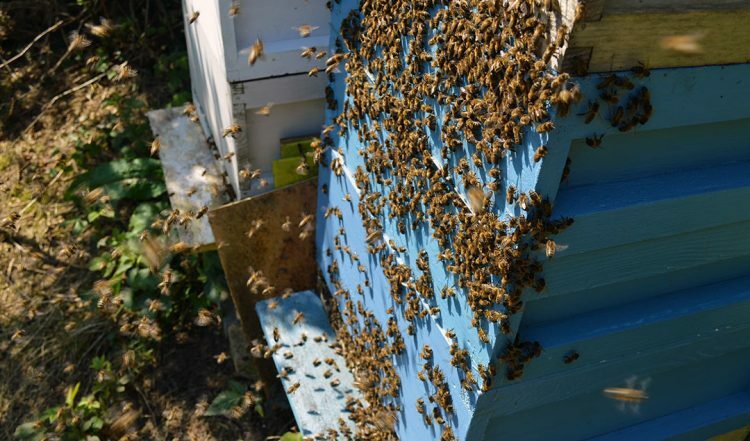 In any case, it will be interesting to see how each does in the coming season — I’ve been told that double-Brood is better for controlling swarms. All this means is that the Queen has double the amount of deep frames to lay eggs on than usual. Aside from working on the Bailey Comb Change, I also went through every frame in both hives in my last inspection. What I found was a bit surprising. First off, I found two Supers drawn out with PINK beeswax. It could be from the pollen that they’re collecting or perhaps from coloured water. It brings to mind hummingbird nectar but there aren’t any hummingbirds or hummingbird feeders here. I shared a photo with other beekeepers and it has everyone else scratching their heads as well. 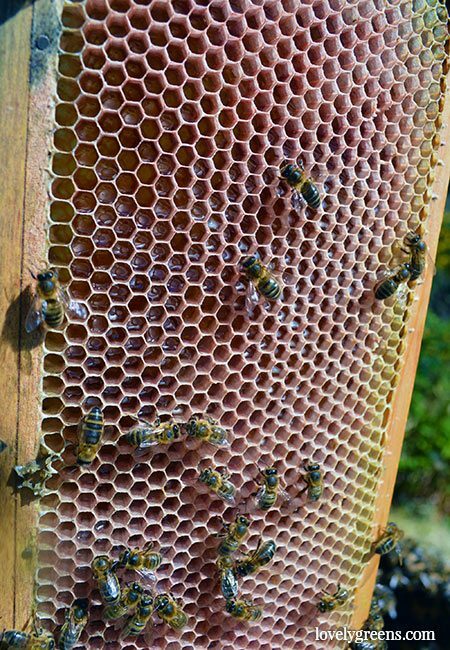 Several years ago I placed a super frame in Primrose — I was introducing a Queen from another hive and the cell was on that frame. 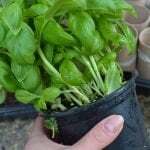 I’d completely forgotten about it since I don’t tend to look that closely in my brood box. 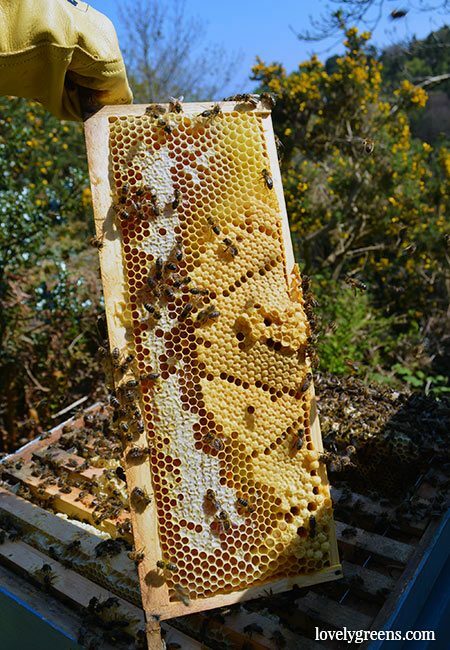 What the bees have done is build an extension of comb from its bottom bar including a mass of Drone cells. Drones are male bees and really, you want to control their numbers. They don’t help with tasks around the hive nor do they make honey. It’s no wonder the girls kick out all the males to die each winter. Another weird thing I found in Primrose was misshapen honeycomb. The wax foundation was warped when I put it in initially and this is the result. It’s a lesson to discard foundation if it’s not perfect otherwise you’ll have a heck of a time extracting honey from your weird honeycomb lobes. I have the next inspection planned for next week but in the meantime, check out my video on how to extract honey from the comb. Also please leave me a comment below if you have an idea of what caused the pink honeycomb — I’m dying to know! Fascinating post, Tanya. 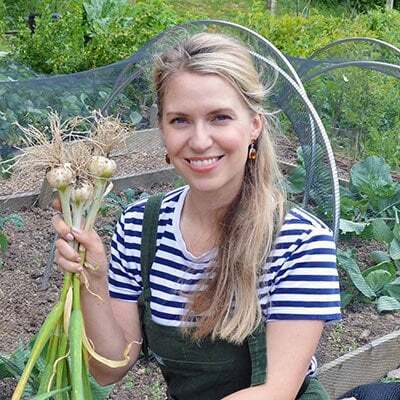 I really admire the work you do with your bees and it’s great that you’ve built so many projects with the produce. Is it as time consuming as it looks? I hope you find the answer to the pink honeycomb and it proves to be beneficial and not a worry! Have a good weekend!